Heat Ghee in a kadai. Add Ragi flour & stir on Medium heat till you get good aroma. It takes appx 15 mins & the colour changes to black. Remove from heat & allow to cool. Add Sugar, Cardamom powder, Cashwenuts & Raisins. 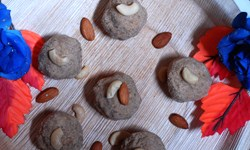 Make laddu of Medium size. If the laddu breaks while pressing, add another 1-2 tblsp of melted ghee. tasnim i have posted the raagi porridge.if it's published,please check. Dear friend is raagi bajra ? please tell me if u know how to make raagi porridge ?